As the holiday season zooms by, you are busy making purchases, planning for gatherings and decorating, but your dentist in Norwood says don’t forget about protecting your oral health. 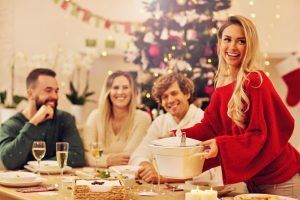 In the midst of enjoying the festivities, there are 5 tips you should keep in mind to prevent any unwanted holiday dental emergencies. While the enamel on your teeth is the hardest substance in your body, it can still be damaged. Attempting to eat hard candy, certain nuts or accidently biting into a popcorn kernel, can lead to a broken tooth and a dental emergency. As a general rule of thumb, if the item you’re considering is as hard or harder than your teeth, it’s best to avoid it. Bacteria are the antitheses of your oral health, and when you consume foods with higher amounts of sugar, they cling to the leftovers and feed on them. As the bacteria digest and absorb the sugar, acids are released that can contribute to tooth decay and gum tissue damage. If you eat chocolate, aim for dark chocolate because it usually contains less sugar. Set a limit for the number of sweet items you will consume to reduce the amount of sugar that bombards your teeth. Chew sugar-free gum after consuming sweet treats to aid in bathing the teeth with saliva. An excellent way to protect your oral health is to practice consistent and thorough oral hygiene, and the two most important habits are to brush and floss your teeth. The toothbrush helps to agitate debris that remain after eating or drinking, and with dental floss, you can get into the hard-to-reach areas where bacteria can get trapped. Not only will drinking water help with digesting your food after a meal, but it also bathes your teeth to aid in removing any leftover particles that could lead to tooth decay. Also, drinking water throughout the day helps to curb your cravings and prevents you from overindulging in the season’s delights. The holiday season is an excellent time to visit your dentist for preventive care. While there, you will receive a full examination, professional teeth cleaning and your dentist will provide some more expert advise on how to avoid any dental emergencies. Whether you want to schedule a preventive care visit or you’re suffering from dental trauma, your emergency dentist in Norwood is available to provide the care you need over the holiday season! Dr. John T. Michaels earned his D.D.S. degree from the Ohio State University College of Dentistry. As a lifelong learner, he has taken over 1000 hours of continuing education in advanced dental procedures. Dr. Michaels helps patients prevent holiday dental emergencies at Norwood Dental Care, and he can be reached for more information through his website.